Miletus was a seaport on the Mediterranean, on the Bay of Latmus. Because of silting filling the gulf, the site is now more than five miles from the coast. The modern name of Miletus is Yeni-Balat. Miletus was a leading harbor during the Persian and Greek periods. Miletus was still an important trade center in Roman times. A temple devoted to the worship of Apollo was located at Miletus. I had the opportunity in summer of 2006 to visit Miletus. The photo below shows the ruins of the harbor, and the harbor monument. The circular base in center of photo is the foundation of the great harbor monument. 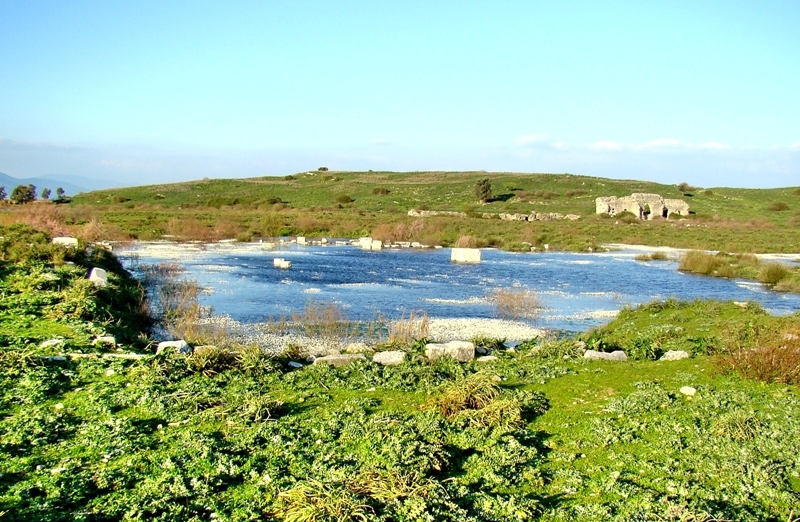 Miletus Harbor. Foundation of Great Harbor Monument. Photo by Leon Mauldin. Again I had the occasion to see Miletus last month. This is a shot of the same area, but reflecting winter and spring rains. Miletus Harbor March 2010. Monument foundation under water. Photo by Leon Mauldin. Note the building which can be seen in both photos, upper right. This is the ruins of a synagogue. There is no record of a church at Miletus in the context of Acts 20. At the head of the harbor Paul would have landed on the marble paved street in front of the harbor stoa, stretching 525 feet along the south end of the bay. On his right he would have seen the large harbor monument built to honor the Emperor Augustus shortly after 31 B.C. 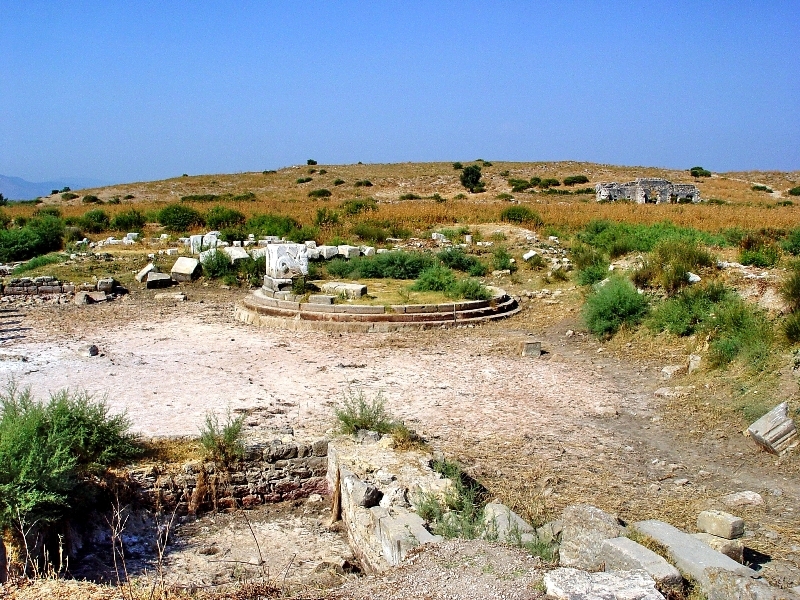 The foundations of the Harbor Stoa and Monument are still there today, and not far from them is a partially excavated synagogue, which Paul may have visited. Had the Apostle walked through the center of town, as he no doubt did, he would have passed the Delphinion, the city’s chief religious center, where Apollo was worshiped. After walking 325 feet down the processional road he would come to the great South Agora, equal in size to some sixteen city blocks and surrounded by something like one hundred shops (Vol.2.4.103). Biblical Significance. On the return route of the 3rd missionary journey, Paul asked the Ephesian elders to meet him here at Miletus (Acts 20:17). Miletus was 37 miles south of Ephesus. The elders accommodated Paul, and thus enabled him to stay near the harbor so that he would not miss the ship going on to Israel. It was here that he poured out his heart to them, admonishing them to take heed to themselves, and to all the flock among which the Holy Spirit had made them overseers (Acts 20:28). They prayed and wept freely; then he departed on the ship, sailing to Cos and the following day to Rhodes (one of the islands included on our tour). Reference is later made to Miletus in Paul’s final letter, in 2 Tim. 4:20, as he notes having left Trophimus there due to sickness. Archaeological work has been conducted mostly by German teams from 1899-1914, 1938-9 and since 1955. We plan to share more photos of Miletus within the next day or two, including some of the areas referenced above in the Bible and Spade quote, so be sure to check back for more. This entry was posted on Tuesday, April 20th, 2010 at 12:28 PM and is filed under Bible History and Geography, Bible Study. You can follow any responses to this entry through the RSS 2.0 feed. You can leave a response, or trackback from your own site. What a difference! It’s nice that you got exactly the same angle, and in different seasons. Leon, thanks for sharing these. Thanks for all the wonderful photos and notes that bring back such pleasant memories. I really like the photo you are using for your message board. Would love to join you for your Gospel Meeting, but alas, ’tis a little to far!